"There is nothing which has yet been contrived by man by which so much happiness is produced as by a good tavern or inn"
WELCOME to the website devoted to any pub, rub-a-dub-dub, nuclear sub, inn, tavern, hotel, bar, boozer, battle cruiser, ale house, beerhouse, taphouse, pothouse, local, saloon, bierkeller, hostelry, coachstop, ginmill, gastropub or watering hole, anywhere in the World, called Black Horse. 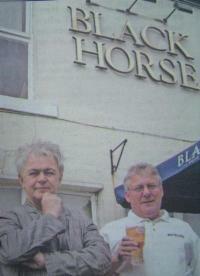 Why visit every Black Horse for a pint? I told Jimothy that the Black Horse represents the Black Lakeland Fell Pony as used by King Arthur's cavalry and, as the pub is in Low Fell, which shares it's name with a place in the Lake District , the sign, in my view, should be of a Black Lakeland Fell Pony, perhaps ridden by Ray Winstone..
Did Jimothy listen? Did he buggary! He has done the artwork for the sign in the style of Picasso...!! Low Fellas...let's have a heated debate!! The pub sign was painted in the style of Picasso...to match the impressionist oil paintings commisioned by Chris, the Landlord, and which adorn the Black Horse Lounge. 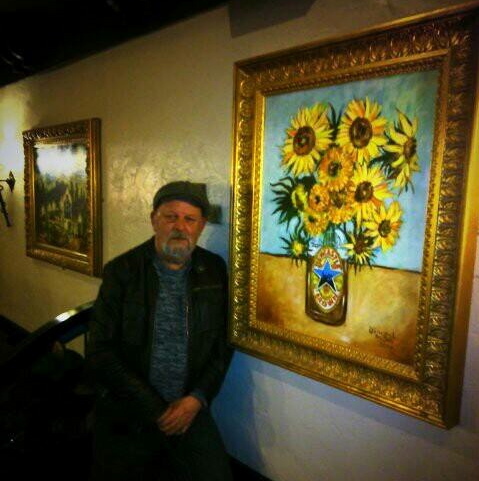 This is Jimothy with his famous Sunflowers in a Broon Ale Bottle, shown in the Lounge. Anyhoo, that's what got me started. 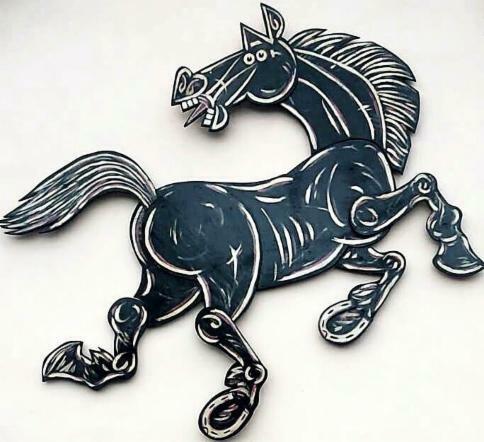 The pubs called The Black Horse, (including those ending with Inn or Hotel or starting with Old, New or Ye Olde or called Blackhorse, with no space or even, I ask you, Le Cheval Noir) only number about 330 (and are beaten, by a short head, by the 350 or so pubs called White Horse). By the time I had identfied all the Black Horses around the country I decided there wasn't too many to prevent me from visiting them all, starting with the ones in the local area. I'll take the rest of my life to do it. This is my theory, this theory of mine, developed by me In the course of looking at Black Horses. I became curious about the inn sign "The Bay Horse". On the face of it, it is just another recognised colour of a horse. This being the case it might be expected to be, more or less, evenly distributed around the country...but it is not. Apart from 5 isolated Southern examples, Bay Horse pubs are found only in the North, predominently Yorkshire but also Lancashire, Northumberland/Durham and a few in Scotland. What's more they are found in clusters...York has a confusing number of Bay Horses and in Felling there are two so close together they are identified as the Top Bay Horse and the Bottom Bay Horse. 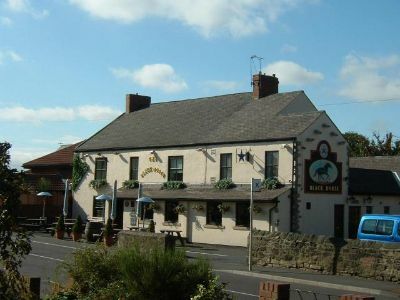 My theory is that the bay horse in the inn sign is not a generic brown coloured horse but a Cleveland Bay, a specific breed of horse emanating from the Cleveland area of North East England. In the Cleveland area itself...Middlesborough and surrounding towns there are a few pubs actually called "Cleveland Bay" It is Britain's oldest breed of horse. (Throughout the middle ages the Monastic houses in the North East were the principal breeders of pack horses. The ancestors of today's Cleveland Bays, particularly on the female side, were such pack horses bred in the Yorkshire Dales).